Late in November I held a Santa’s Workshop Bingo event. It was so much fun! The theme was Santa’s Workshop and I used products from the very popular Santa’s Workshop Suite in the Holiday Catalog. Everyone received a good bag full of supplies for their projects and lots of extras to take home. We had stamping and played some bingo for prizes. Yummy little snacks to eat and it lots of laughter and fun. It was perfect afternoon to start the Christmas season. One of the projects that everyone made was this Santa’s Workshop Note pad. I use lots of note pads – I’m a list person. And this time of year there are lists for everything. So this was not only cute but a practical project too. I found notepads at the office supply store and measured those and then measured a piece of card stock to fold around it. Don’t forget to include the depth of the spine and any over hang you want. Then I decorated the front with a strip of paper from the Santa’s Workshop Specialty Designer Series paper and a card from the Santa’s Workshop Memories & More card pack. It’s tied shut with a piece of the Poppy Parade ribbon. I used some paper and one of the stickers from the Memories & More card pack to decorate the little note pad. Then attach it with Tear & Tape to the inside. Tie the the cover shut with the ribbon and then slip in your favorite holiday pencil. There are a variety of stickers in the Memories & More card pack – use those to decorate your pages as desired. Yesterday I shared about my Bubble Over Bingo Event that I held in January. So today I wanted to share the three projects that everyone made using the Bubble Over Bundle of products. These are so fun! Those were the Make&Take Projects at my Bubble Over Bingo event. Thanks for stopping by. I love to play Bingo Stampin’ Up! Style! You can use the Bingo Stamp (it’s on the retiring list) or My Digital Studio to Create the Bingo card. 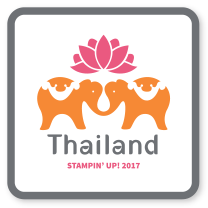 And because it is so much fun I made sure that we included it as part of the Stamp, Scrap & Create Escape Retreat. During the day on Saturday everyone stamped their own Bingo Card using the Every Little Bit stamp set (also on the retiring list). And punched out markers for their board. Stamp each image only ONE time on your card. On Saturday night – Tyler grilled burgers for us. I missed getting a picture of him – I wonder if anyone else took one.We had a good dinner before we played Bingo. Then we played Bingo for prizes. I use the stamps as the call pieces – I just drop them all down in my little SU trash bin. After Bingo we went out to our campfire for smores – I’ll post those pictures tomorrow. If you enjoy the Bingo idea be sure to get the stamps before they retire – there is also a Spooky Bingo Bits for Halloween and a Jolly Bingo Bits for Christmas. Get them before they are gone! 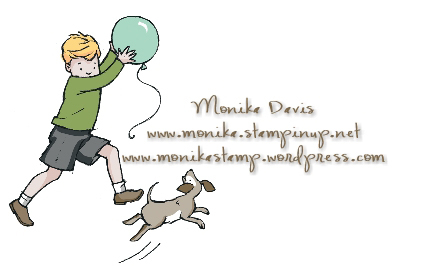 I can order them for you or go to my website to place an order – www.monika.stampinup.net .